Above left to right are the Aquatic Blue, Ash Grey, Athletic Heather Port & Co. Jersey Blend Company Polo Shirt Colors. Above left to right are the Athletic Maroon, Charcoal, Dark Green Port & Co. Jersey Blend Company Polo Shirt Colors. Above left to right are the Deep Navy, Gold, Jet Black Port & Co. Jersey Blend Company Polo Shirt Colors. Above left to right are the Kelly Green, Light Blue, Lime Port & Co. Jersey Blend Company Polo Shirt Colors. Above left to right are the Orange, Purple, Red Port & Co. Jersey Blend Company Polo Shirt Colors. Above left to right are the Safety Green, Safety Orange, Safety Yellow Port & Co. Jersey Blend Company Polo Shirt Colors. 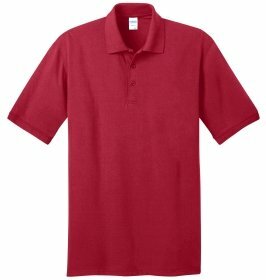 Above left to right are the Royal, Sangria, Sand Port & Co. Jersey Blend Company Polo Shirt Colors. 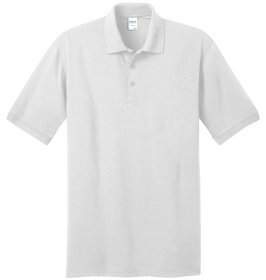 Above is the White Port & Co. Jersey Blend Company Polo Shirt Color. You may assort the colors for the total order of company polo shirts. You MUST maintain the same art design, embroidery thread colors throughout the entire order.